"This is a subject that screams out for serious scientific investigation"
but still couldn't avoid X File allusions. Despite this the profile was not too bad. 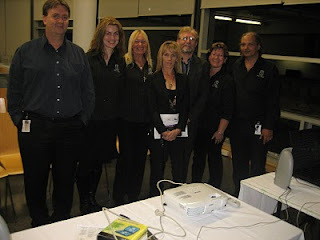 The TV channel 7 Morning Show got excited with odd clouds and UK UFO file releases getting me in for 2 seperate shows within a week - with Dr. Martin Plowman (who did a recent PhD on ufology of sorts) on 24 February, and with Australian Skeptic Ian Bryce on 2 March. TV channel 9 had me in on the Weekend Sunday show (14 March) for a surprisingly good but short piece which focused on the DNA evidence featured in my book "Hair of the Alien." 1868 Parramatta Park - engineer & surveyor Frederick Birmingham sees "Flying ark" land in park, taken onboard. 1927 Fernvale near Murwillumbah - family witness strange aerial lights, UFO landing, live stock mutilation and strange creatures in an early version of the "Mothman Prophecies"
1969 - Anzac Day, evening - Greenacre Sydney - Mother, daughter & taxi driver observe UFO hovering over park - figures seen inside UFO. 1970 - June - Emerald Beach, near Woolgoolga, NSW - truck driver sees UFO land. Physical evidence verifies the landing. early 1970s - Kiama - UFO event with entities seen inside UFO, which also project "solid light" down onto people on beach. 1972 - Bents Basin near Wallacia/Penrith - group of people see UFO on ground & encounter "robot" type entity - car catches fire, witnesses flee area on foot. 1973 February - Norah head, central Coast, NSW - people in car witness UFO close encounter. Car lights effected. Same location in 1975 has UFO with smaller objects coming out of it "attacking" group of young people camping in the area. 1973 - Dorrigo Plateau - Tyringham & Dundurrabin area - heavy localised UFO "flap" witnessed by local farmers and resident, investigated by me while I was at the University of New England, who also witnessed some of the sightings. Photo taken. 1978 - Bakers Creek Falls, near Armidale - driver has close encounter with UFO and experiences "missing time"
1995 December 28 - major close encounter & sightings in Gosford Central Coast area - witnesses include police - UFO seemed to be sucking up water. 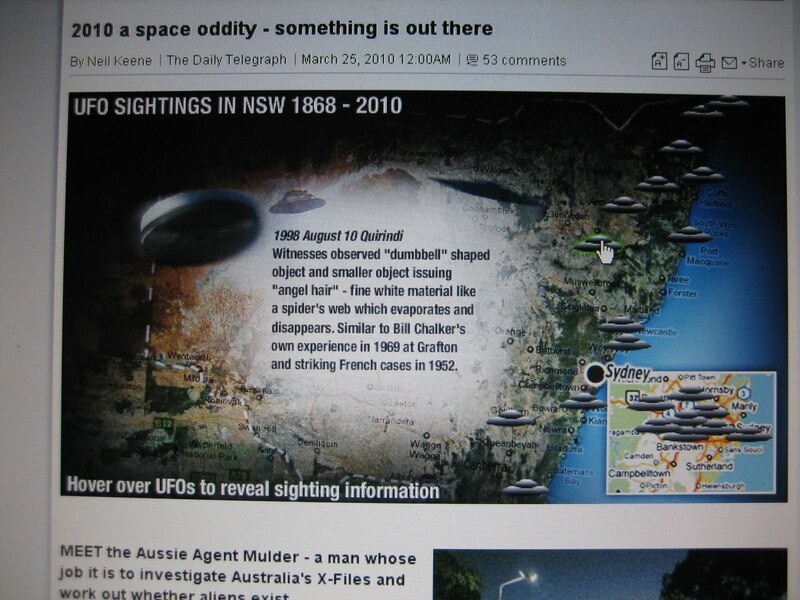 1998 August 10 Quirindi - witnesses observed "dumb bell" shaped object and smaller object issuing "angel hair" - fine white material like spiders web which evaporates and disappears. Similar to my own experience in 1969 at Grafton and striking French cases in 1952. 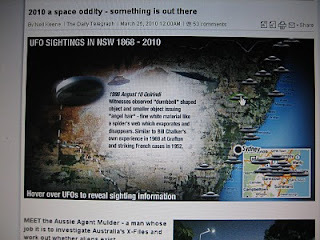 2007 January 26 (Australia Day) Earlwood Sydney - nurse and family witness close encounter with UFO which moves below roof line of units and between their unit and neigbours. Some sort of "communication" occurs during encounter. 2008 - February 29 - Coogee Sydney - man witnesses UFO landing on road - entity seen inside object - appears to burn part of road and nearby tree. Yet another "sound byte" outing on the TV Channel 9 morning show with Kerri Anne where I tried to highlight the difference between UFO and "ET craft" and that Fiona's photos might be the former but not the latter, continued the UFO theatre. Trying to convey the idea that investigations often take a while and might actually be subject to changing conclusions or positions depending upon the direction the evidence suggested seemed beyond the ken of the media. The answer "had" to be available immediately or not at all, it seems. "As she says Fiona is just a mother from Chipping Norton who took some interesting photos, so much so, that they ignited a wildly popular theatre which played out a potent narrative on the UFO controversy. As I said on the Kerri Anne morning show on TV Channel 9 on Friday March 26, I felt that the photos were most likely not evidence of aliens or ETs, but they might be evidence of UFOs. Perhaps, perhaps not. The show did not allow for the kind of more appropriate dialogue that comes with a reasoned and sensible discussion informed by careful scientific enquiry and research. That takes time and seldom occurs in the time frame driven by “sound bite” 24 hour news cycles of the modern media theatre. While some might think the photos are already explained, depositing them in hoax, misinterpretation or other categories, others are less certain and the debate continues. For me they fall into the probably explainable category, but with some unresolved aspects, subject to further enquiry." aircraft while flying near the Chipping Norton area back in 1994. This was his second sighting which he had kept quiet about because he thought it might affect his pilot's licence. It turned out I had investigated his first sighting he had with a friend back in 1991. He told me, "Amazingly, you advised us at this time that we would probably see another incident in our lifetimes." The UFO theatre often delivers some interesting paydirt making the whole circus worthwhile.